Senetti pericallis, the first flower of spring from The Suntory Collection, adds vibrant color to the cool spring season. Deep into the winter season when it seems the cold and dark are here to stay, nothing speaks to the promises of springtime more than blooms in vibrant colors. Flowers in pinks, blues, lavenders and magnificent magentas lift the spirits and bring hope that spring is about to be sprung from its wintry confines. “Floral color is sadly lacking in the early-spring season,” says Evelyn Alemanni, an award-winning gardener, designer and author. “Thankfully the Senetti® collection of pericallis from The Suntory® Collection offers candy-colored blooms on plants tough enough to handle the chilly temperatures during the turning of the seasons.” These sturdy yet seductive blooms are found on plants that are a beautiful sight come springtime and are also tolerant of temperatures as cold as 35°F. What’s more, Senettis can be used indoors and out. “It’s a perfect transitional plant,” says Alemanni. “I use them as potted plants to add accent colors on a living room window, kitchen table or enclosed porch in very early spring. As the days warm, I’ll place them on the front step or on a patio to add some color to the monotones of the season.” If the temperatures are forecast to drop below 35°F, be sure to bring the plants inside the garage or front entry. The Suntory Collection has added two new colors to the Senetti line for 2014, bringing the total to 16 unique colors. Super Blue is the bluest of the pericallises available to consumers today. These vibrant-colored blooms cover the entire top of the plant, producing as many as 200 flowers on one 10 to 12-in. potted plant. “At 2.5 to 3 inches in diameter, that’s a lot of color,” Alemanni notes. Super Blue grows to about 2 feet in height and width, making quite a colorful impact. 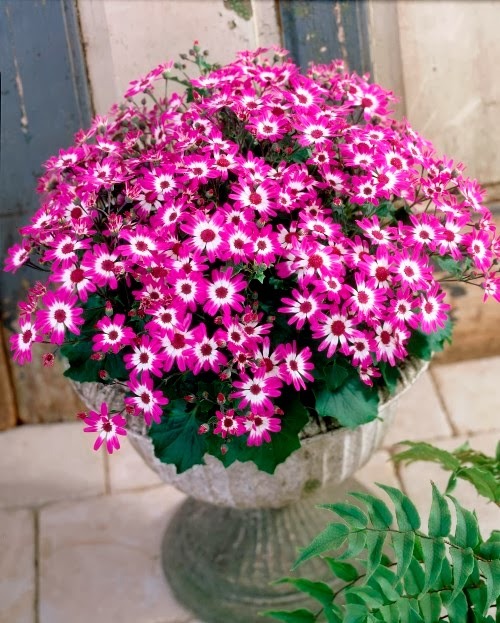 In general, the Senetti® pericallis collection prefers full sun to partial sun conditions, with even and consistent watering. To learn the story behind the Senetti collection, visit http://www.youtube.com/watch?v=zjSI4hGPDNM. 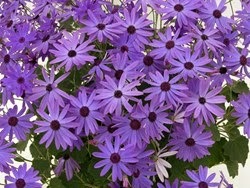 Find Senetti at your favorite garden center or purchase directly through http://www.BigBadFlower.com.